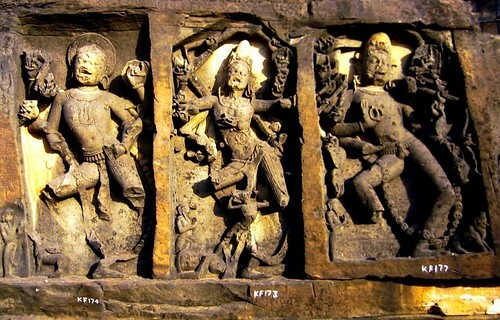 The bhairava-srotas of the shaiva mantramArga was clearly one of the most speciose branches of the shaiva-shAsana. From the ancestral bhairava-srotas base that itself most probably arose from the kApAlika-oriented streams of the underlying shaiva atimArga the system spawned several distinctive branches: 1) An early branch was the dakShiNashaiva stream centered around the worship of svachChanda bhairava; 2) the system of kapAlIsha bhairava mainly taught in the archaic brahma-yAmala (distinct from the later brahma yAmala of the drAviDa country). The influence of the yoginI-kula system, an early representative of which was the kaula-j~nAna-nirNaya of matsyendra, resulted in several distinct kaula systems of the bhairava-srotas (these could be colloquially termed “shAkta” influenced): 3) the trika system originally with the triadic bhairava-s (ratishekhara, bhairava-sadbhAva, navAtman) and their shakti-s (parAparA, parA and aparA) or the bhairava shabdarAshi and his shaktI mAlinI. This is expounded in the tantra-s beginning with the siddhayogeshvarI-mata. 4) The kAlIkulA or the krama system which is associated with tantra-s such as kalIkula-pa~nchashataka and the mantra system of the early pA~ncharAtra-influenced deity kAlasaMkarShaNI (who is one of the evolutes of the old ekAnaMshA). 5) The kubjikA-mata taught in the system stemming from the saMvartAmaNDala sUtra-s. This stream shared an early evolutionary history with the trikA system. 6) The shrIkula system which has many distinct varieties such as the nine nityA-s and kAmashiva, 11 vilAsinI-s, tripurabhairavI, bAlA, tripurasundarI and the 16 nityA-s and Ananda bhairava, kameshvarI and kAmeshvara. 7) In addition to these, the bhairava srotas underwent a syncretic development with a much earlier independent stream of the mantra-mArga, i.e. the worship of mR^ityu~njaya. This resulted in the system of amR^iteshvara bhairava and amR^iteshvarI which is expounded by the netra tantra. Also in this stream is the special worship of amR^iteshvara and svachChanda bhairava (in one of two forms, sakala-bhaTTAraka or niShkala-bhaTTAraka) with their shakti-s in the bhairava chakra-s drawn from the svachChanda system. Further, the netra-tantra has a secret chapter known as mahAbhichAra for the performance of fierce abhichAra rituals that is not present in the published version. This section of only taught within the tradition of the dIkShita-s of the netra system and primarily concerns the homa-s to a combined form of amR^iteshvara and svachChanda known as mahAbhairava in the tradition. Other syncretic traditions of the bhairava srotas include: 8) the system of AkAsha bhairava, which represents a combination of the bhairava srotas with the earlier garuDa-srotas and 9) the “extant” jayadratha yAmala which presents itself as a version of the original shirashCheda that was transmitted as a combination of the vAma and bhairava streams (rather than the pure vAma system as taught in the vINAshikhA tantra with tumburu and his 4 sisters, i.e. the ancient chatur-bhagini system). The voluminous yoga-vAsiShTha also alludes to the combined worship of tumburu of the vAma-srotas along with bhairava in the midst of the mAtR^I chakra with yoginI-s like alambushA, suggesting that this vAmA-bhairava syncretism was also once popular (nirvANa prakaraNa 18.26; chapter 18 has a description of shiva and the mAtR^ikA-s). Likewise, certain lineages of the bhairava-srotas, mainly that of svachChanda bhairava, also influence the Urdhvas-srotas or the siddhAnta tradition. For example, IshAnashiva, somashambhu and vishvanAtha in their ritual manuals use the prescriptions of the svachChanda-bhairava tantra. 10) The raseshvara system is an offshoot of the older svachaChanda bhairava system that was centered on the tradition of rasa-siddhas. Its central deity rasabhairava and his shakti rasA~nkushI are emanations of svachChanda bhairava and his shakti aghoreshvarI. 11) Some texts like the brahma-yAmala hold a view that there is an additionally adhaH srotas which deal with the vaiShNava tantra-s pertaining to nR^isiMha. Some of these appear to be influenced by the bhairava srotas via the more ancient rudra-nR^isiMha equivalence. In another definition the adhaH srotas is supposed to contain the tradition of hATakeshvara. A text called the AnandAdhikAra tantra is said to be a part of this tradition by abhinavagupta but it does not apparently survive. This srotas seem to be a later addition to the original system, mainly within the traditions arising from the original bhairava srotas. Within the traditions stemming from the bhairava srotas, e.g. the jayadratha yAmala, there is an internal classification that tries place its tantra-s in pITha-s, which throws some light on the evolution of the system. The first pITha is the mantra pITha which primarily include tantra-s pertaining to the worship of the various forms of bhairava. This pITha begins with the svachChanda-bhairava tantra. The vidyA pITha is the next includes the yAmala-s, siddhayogeshvarI-mata, yoginI-jAla-shaMbara, sarvavIra, and samAyoga among others. This set clearly concerns the early shaktI oriented tantra including those of trika and other early kaula works. The 3rd division is said to be the mudrA pITha whose tantra-s are said to be those like hR^idbheda, mAtR^ikA-bheda and kubjikA-mata. Clearly, works like kubjikA-mata show a certain posterior temporal relationship to the early vidyApITha tantra-s suggesting that there might be an evolutionary stratification of the tantra-s in these three pITha-s within the bhairava srotas. The 4th pITha the maNDala pITha is not described in any detail and is mentioned as having the “shata-maNDala” taught by pa~nchashekhara bhairava as its root sUtra but is largely found as a part of the other pITha-s. In the exposition of the pITha-s provided by the jayadratha yAmala the first narrative provided by bhairava is that of the svachChanda-bhairava tantra. He states that the 8 bhairava-s taught this lore first to ananta. This was then taken up by the early teachers, namely shrIkaNTha and lakulIsha. lakulIsha transmitted it to vaidika R^iShi-s like vAmadeva gautama and musalendra. His best student was musalendra who then transmitted his teaching further to the world. Thus of all the tantra-s within the bhairava srotas, it appears that svachChanda tradition is directly linked to the lakulIsha tradition of the atimArga of the shaiva-shAsana. Similarly, in the lists of tantra-s belonging to each srotas in the shaiva tradition, the dakShiNA srotas or that of bhairava usually begins with the tantra of svachChanda bhairava [The only exception is the mR^igendra of the Urdhva srotas that begins the list with asitA~Nga; but we know from the jayadratha yAmala account that the asitA~Nga is an independent transmission of the svachChanda tradition]. From this we may infer that the svachChanda was one of the primary tantra-s of the dakShiNa srotas and that even the jayadratha yAmala, which temporally followed the svachChanda, remembered a certain link it had with the underlying pAshupata system of lakulIsha. Further, while one may interpret the links to the svachChanda bhairava tradition seen in the later siddhAnta ritual manuals as being a lateral influence, we must keep in mind that this influence was allowed in the first place due a certain core similarities between the two systems. These similarities are best interpreted as stemming from the common ancestor of the mantra-marga before its rapid radiation into the 5 srotas. This link also suggests a certain atavistic connection between the svachChanda and the origins of the mantra-marga tradition. The idea here is to further explore this link. Now the bhairava srotas as whole is supposed to have emanated from the aghora face of rudra. The li~Nga purANa 2.26 expounds the worship of aghora (aghorArchana vidhi) to be performed by a smArta: The invocation of aghora might be done in a sthaNDila but performing it in a li~Nga is said to be crore times better (this preference is of course a peculiarity of the li~NgapurANa). It states that the brAhmaNa after performing his bath and saMdhyA rituals dusts himself with ash from the agnihotra fire. He purifies himself with the shiva pa~nchAkSharI and then performs aghorArchana. For this the mantra used is the brahma mantra or the bahurUpI R^ik as provided in the taittirIya AraNyaka. However, it is strange that this form of the mantra is given because later in the dhyana the 32-syllabled version, as given by the kauNDinya recension of the pAshupata sUtra, is alluded to. In any case the nyAsa which follows does specifically consider the TA form rather than the 32 syllabled form: This suggests that dhyAna was perhaps simply adapted from a ritual text that originally used the 32-syllabed version. This dhyana is more or less equivalent to the dhyana of svachChanda bhairava given in the eponymous tantra (2.82-2.93). In fact several of the words/phrases are identical between this part of the SVBT and the LiP. Importantly, aghora here shares with svachChanda bhairava specific features such as 18 hands and the attributes in each of them, the distinctive scorpion ornaments. The bodies of both are supposed to be composed of the 38 mantra fragments of the pa~ncha-brahma mantra-s. Both are invoked in the respective texts using the aghora brahma mantra. But the aghora mantrarAja as it appears the SVBT terms is the exact anuShTubh of 32 syllables as mentioned in the dhyAna in the LiP 2.26. This clearly establishes svachChanda bhairava as an ectype of aghora, the deity of the bahurUpI R^ik of the old pAshupata system. An iconic depiction of this deity in an ithyphallic form [footnote 1], made by the chandrAtreya clan (chandella) from the core Khajuraho period, can be seen in the nilakaNTha temple in Kalinjar fort in modern Uttar Pradesh. This link to the aghora mantra (including its vaidika origins) is not just restricted to the svachChanda bhairava tantra, but remained in memory through the development of the bhairava srotas all the way to the kubjikA tantra-s. The kubjikAmata gives a detailed description of the aghora kriyA in its chapters 8 and 9. In chapter 8 the aghora mantra is introduced as the anuShTubh mantra rAja. In the procedure described here the devI kubjikA is first invoked in the yoni-maNDala after digbandha etc and thereafter svachChanda bhairava is invoked as the shikhAshiva in the shikha of the goddess. The pujA and homa of svachChanda bhairava is done using the mantra rAja. This is followed by the aghora digbandha, nyAsa and prANAyama. Then the sAdhaka begins the kula meditation on the aghora mantra combined with 5 praNava-s on either side that stand for the 5 deities from sAdAkhya (sadAshiva) to brahmA. The sAdhaka conceives aghora aShTAkapAla in the brahmarandhra and from the 32 syllables of the mantra emanate 32 devI-s who are alluded to both in the LiP and the SVBT. This aghora surrounded by these 32 shakti-s who are worshipped as laid out in the kubjikA tradition, then showers nectar in every direction. This maNDala of aghora is termed the saMpUrNamaNDala. Then the chapter 9 of the kubjikAmata explains the link between aghora and agni. This link is a reminiscence of the shrauta deployment of the aghora mantra in the maitrAyaNIya tradition, where it is used after the chiti has been piled for the agnichayana. This chapter expounds that the knower of the agni-aghora link and the worshiper of the shikhAshiva who has this awareness is the true AhitAgni (probably a kApAlika connection). Thus, it is clear that both the early saiddhAntika and bhairava tantra-s deployed a pa~nchabrahma mantra (or mantra-s) as the central mantra-s in their system. This connection to the primary mantra-s of the underlying pAshupata systems suggests that the proto-mantramArga was probably centered on specialized mantra deployments of the pa~nchabrahma [Footnote 2]. Given that the bahurUpI R^ik additionally has the special position of being an early mantra within the pAshupata system itself (found in the YV saMhitA-s and independently of the sadyojAta, vAmadeva and Ishana mantra-s in the AV-parishiShTha 40), it is quite possible that, from rather early on, within the pAshupata system there was a distinct stream that focused on the aghora, from which the bhairava srotas emerged [of course, even the degenerate modern aghori-s, who are largely only nAma-mAtra still deploy the aghora mantra]. Another point is the worship of aghora in the form of a li~Nga that is laid out in the vidhi provided in the LiP. This is again reiterated in the context of the royal apotropaic ritual in LiP 2.50 [Footnote 1] where aghora might be invoked either in the sacrificial fire or in a bANa-li~Nga stone. This invocation of the deity in the li~Nga appears to have been another feature shared by the siddhAnta tantra-s (very prominent) and the early bhairava srotas with ancestral ati-mArga [the nidhanapataye etc mantra-s of li~ngasthApana are originally ati-mArga mantra-s provided with the pa~nchabrahma in some interpolated transmissions of the taittirIya AraNyaka]. This feature is not entirely forgotten in later evolutes of the bhairava srotas. 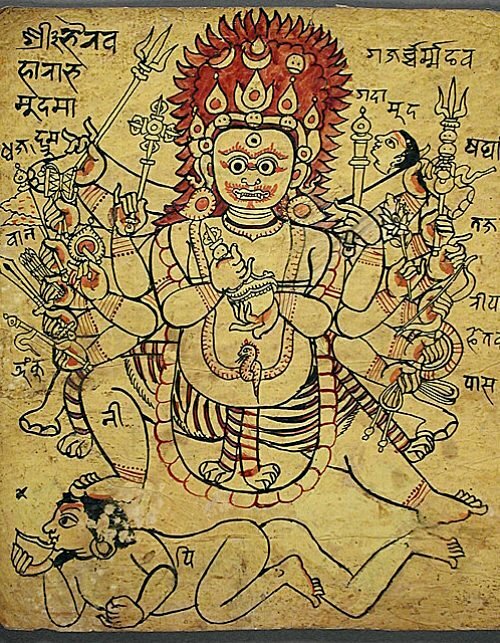 For example, kubjikAmata narrates the tale of the li~Nga manifestation of the bhairava as udyAna bhairava right at the beginning of its frame story. In fact, there appears to have been a now lost bhairava tantra, the tilakodyAna bhairava tantra that appears to have dealt with the worship of the bhairava in the li~Nga.More generally, both the early siddhAnta and bhairava tantra-s share certain elements that are commonly not associated with the former. 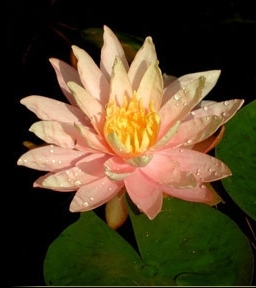 These include the yoni sAdhana with a beautiful dUtI (e.g. described in the section 11.41 onwards in the large mata~NgapArameshvara of the saiddhAntika-s) and the crematoria rituals of the niHshvAsa-saMhitA tattva section. These suggest that such features were already present in the ancestral mantra-mArga, which in turn developed these from the ati-mArga precurors. In the context of the early shaiva tantra-s containing sAdhana-s/prayoga-s deploying the pa~nchabrahma mantra-s the siddhashaMkara or the sanatkumArIya pa~nchabrahma tantra is interesting. The text itself is a small and lacks the systematic structure typical of a typical large tantra such as svachChandabhairava, mata~NgapArameshvara or kubjikAmata. It also does not have the distinction of being mentioned (to my knowledge) in the commentaries of great authorities northern or southern. Its presentation is also not contiguous — the initial part is presented as a teaching of sanatkumAra transmitted by vyAsa to the world. The later part is presented as a typical conversation between the bhairava and his shakti. These features would incline one to take it as a work of rather secondary significance. Yet, it has certain distinctive features that suggest, while it was forgotten and probably supplanted in the main bhairava srotas, it clearly preserves an early system of tAntrika prayoga- based on the pa~nchabrahma mantra. The work as it survives comprises of 5 paTalas and was recovered and edited by a tAntrika shyAmasundara tivArI from Moradabad (Uttar Pradesh) from a fragment from Nepal and a manuscript from Varanasi (I have not been able to locate these in any catalog) in the late 1800s of CE. It is not clear if this is the entire text as it stands. This part has a verse from a certain kulArNava tantra that is a cognate of the first verse tagged on before the actual first verse of the text. At least I am not able to find this verse in the printed version of the kulArNava tantra [Incidentally other citations to this tantra by shrIvidyA tAntrika-s are also not traceable. But some of them seem to be present in a text called kulapradIpa whose fragment shrI SDV kindly provided me]. It is not clear if shrI tivArI did this or it was tagged by some exegete in a manuscript. paTala 5.2: siddhi-lakShaNaM; 3 long verses. This is taken to mean to the south side of the image of the deity, the li~Nga or the ritual fire. Given that the south face of the rudra is aghora it appears that it was an old shaiva practice to perform the rite facing aghora. This connection might explain the importance of the aghora tradition in the evolution of the shaiva-shAsana. Further in the pAshupata sUtra-s, the description of the anti-social practices is mainly described in the section associated with the aghora mantra. This might provide the old link between these practices and the socially transgressive trends, such as the crematoria rituals seen in the bhairava srotas (For example, note the ritual of the aghorI-maNDala performed in the crematorium as per the brahma yAmala). Here the deployment of the svachChanda mantra is said to destroy evil beings like DAkinI-s, graha-s and vetAla-s. Here it is stated that the fumigation with the nirmAlya of shiva on which the mantra of aghora has been chanted a 1000 times is verily a means to destroy rakSha-s, bhUta-s, vetAla-s, graha-s vinAyaka-s, DAkini-s and various diseases. This negative view of the DAkini-s and bhUta-s presented by the SST is comparable to a similar negative view of them taken by the bodhAyanokta mahAnyAsa, a tAntro-vedic ritual. Here we note that bhUta-s, preta-s, pishAcha-s, DAkini-s and rAkShasa-s are mentioned as being in the retinue surrounding aghora. Thus, to us it appears that there is a more positive or rather accepting view of these beings in the latter, which is consistent with most of the latter tantra-s where the DakinI-s in particular are seen as a form or agents of the great shakti. More tellingly, the SST has only a negative view on the vinAyaka-s, who by the time of most of the later tantra-s have been subsumed in the vinAyaka as a positive deity. We take this to mean that the core of the SST is actually a fairly early text from the early mantra mArga. In contrast to the above beings the yakShiNI-s are viewed more acceptingly. The SST 3.2-3 describes a nocturnal ritual with the japa of the tatpuruSha mantra holding the ear of a goat performed to the south of a li~Nga in order to have a beautiful yakShiNI manifest. Similarly, several other prayoga-s for the manifestation of yakShiNI-s are given. These include one with the sadyojAta mantra that is used to manifest the famous vaTa-yakShiNI (SST4.53). The one who irrespective of purity or lack there of in all states worships rudra is said to be the spontaneous worshiper. Then after invoking aghora in ones own self, one performs the aghora digbandha with fragments of the mantra. Her attributes mentioned here are somewhat different from the conventional ones associated with parA: a rod, a hook, battle scissors and flag with the classical lunar insignia. It states that if the mantra of (a)ghoreshvarI is performed along with the mantra-rAja then the benefits are doubled. The core of these mantra-s have a certain relationship to one of the kANDa of the 32-syllabled samaya-vidyA taught in the chi~nchinI-mata. They are also intimately related to the mantra-s of parAparA in the trika tantra-s. Thus, the shakti of aghora/svachChanda is clearly foundation from which the central shakti of both trika (parA; also parApArA based on the mantra) and of the pashchimAMnAya (kubjikA) have emerged. This also seems to be the foundation of the goddess aghorA described in the yoginIsaMchAra tantra. -The text teaches a specialized mudra of ghoreshvarI (SST 1.31-34) where the hands are folded into a complex pose and used to close the eyes. Then the text mentions that one must carry out chalana of the tongue. We take this to mean the performance of the churning as in the khecharI practice. In conclusion, we take the core of the SST to be a relatively old text of the early mantra mArga that lead to the bhairava srotas — its primary deity and mantra is that of aghora though the remaining pa~nchabrahma are used. Given that the structure of the tantra often recapitulates its evolution, the incorporation of aghora/svachChanda in the pashchimAMnAya is seen as coming from this original tradition. It is also important to note that while this text emphasizes the pa~nchabrahma just like the pAshupata and saiddhAntika works it also clearly introduces an early form of the shakti mantra and mudra emphasizes its importance. It is this shakti that was to develop extensively in the subsequent tantra-s of the vidyApITha within the bhairava srotas. Thus, we see the first 3 chapters and chapter 4 till the end of the IshAna kalpa as forming the archaic core of this text, but the terminal portion of chapter 4 and 5 could well be later accretions. In this context we should note that the brahma yAmala states that the vidyApITha of the dakShiNa-srotas contains along with several bhairava tantra-s and yAmala-s the following additional tantra-s: mantra-mAlinI, aghoreshI*, aghoreshvara*, krIDAghoreshvarI*, lAkinI-kalpA, marIchI, mahAmarI, ugravidyAgaNa, two bahurUpI-s* and aghorAstra*. We posit that the one marked with a ‘*’ were tantra-s specially pertaining to the old aghora and aghoreshI mantra-traditions, which might have been related to the material presented briefly in the SST [Footnote 3]. The aghorAstra tantra most likely taught the famous astra mantra that is dedicated to aghora and is an a~Nga of the mantra-rAja. Footnote 1: The ithyphallic depiction of the deity is not mentioned in the classical visualizations of svachChanda or aghora. However, there is a possible allusion to this form in the royal apotropaic aghora ritual provided in LiP 2.50, which is prescribed for a kShatriya after the model of a ritual conceived by ushanas kAvya for the daitya hiraNyAkSha. Here, the rAjanya is supposed to visualize aghora in his own body and in the dhyAna the term digambara etc might be suggestive of the ithyphallic form. Footnote 2: We should note that in parallel the early pA~nchArAtra tantra-s had a corresponding vaiShNava pa~nchabrahma. However, none of these vaiShNava pa~nchabrahma mantra-s are exactly found in any vedic text (of course the viShNu gAyatrI is a late interpolation in some vedic material).Thus, the vaiShNava pa~nchabrahma was most possibly evolved to have a parallel for primary mantra-s i.e., the pa~nchabrahma, in the early shaiva tantra-s. One might also see a parallel between the aghora mantrarAja and the ugraviShNu mantrarAja (in fact, in some pA~ncharAtrika prayoga-s the saMpuTikaraNa of the two mantra-s is explicitly done). Footnote 3: R1’s father mentioned that there is a manuscript of a text termed the aghora-mUla-tantra survived in Nepal until recently that he suspects is indeed one of the root tantra-s of aghora from which the SST could be drawn. It could be aghoreshvara mentioned by the brahma-yAmala.